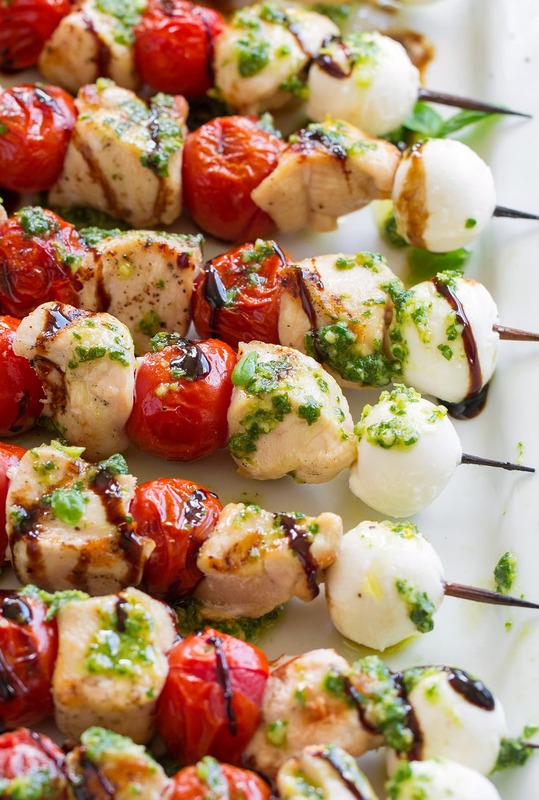 What better way to start out grilling season than with these Caprese Chicken Kebabs! These are a new summer staple! 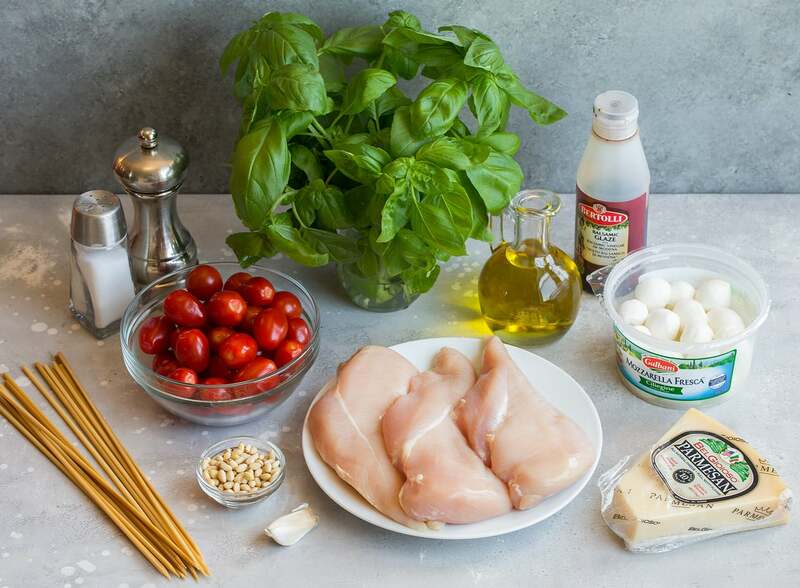 Here bite size chicken pieces and cherry tomatoes are threaded onto skewers and cooked on a grill to give them a light fire kissed char, then you add fresh mozzarella and finish them off with fresh homemade pesto and a sweet and tangy balsamic glaze. 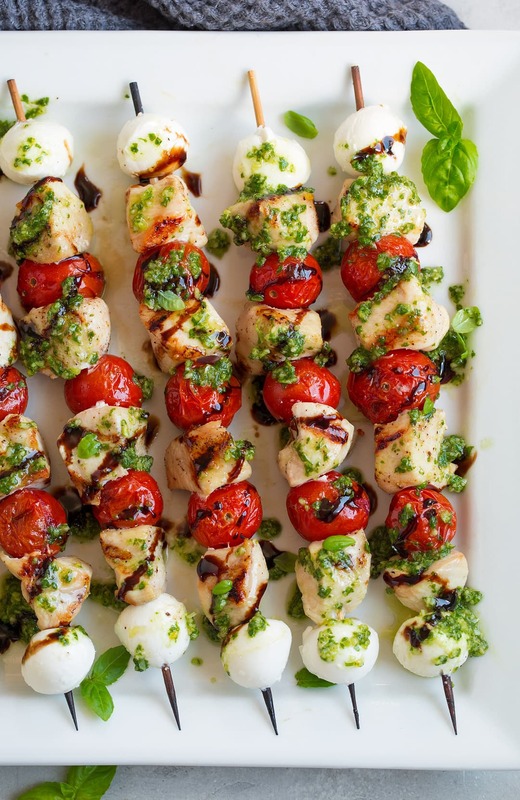 These Caprese Chicken Kebabs are anything but boring! 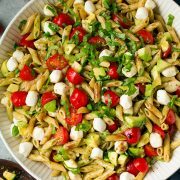 I mean isn’t that caprese flavor combination one of the best and here you get all those flavors, plus the bonus of serving them skewer style which always makes food better right? 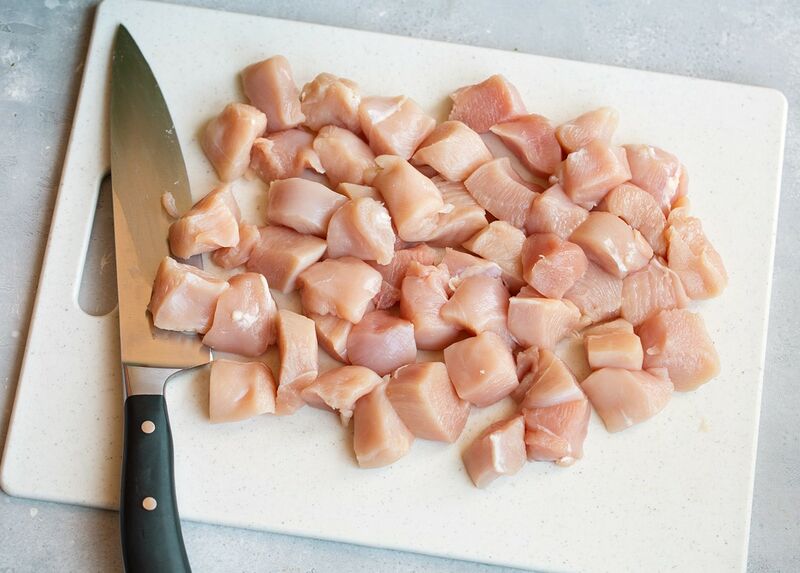 Cut the chicken into bite size pieces and prep other ingredients. Preheat your grill. 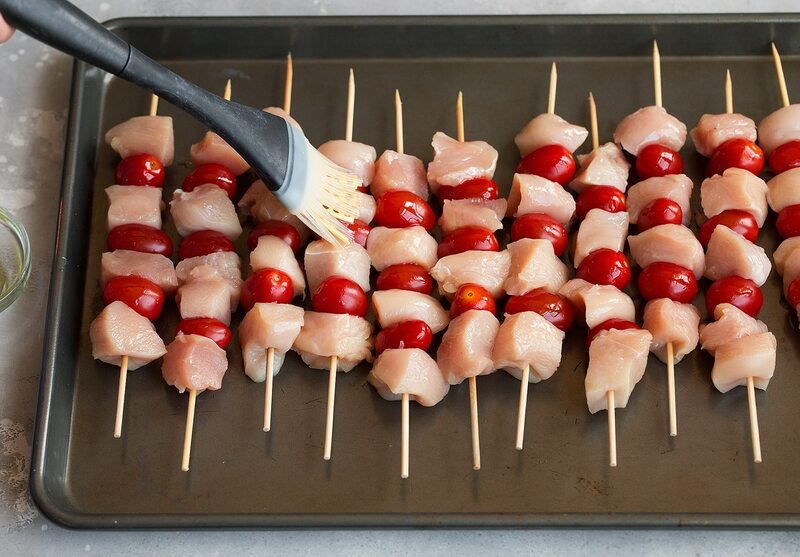 Thread chicken and tomatoes onto skewers. Brush just lightly with oil and season with salt and pepper. Grill until chicken is cooked through, about 4 – 6 minutes per side. 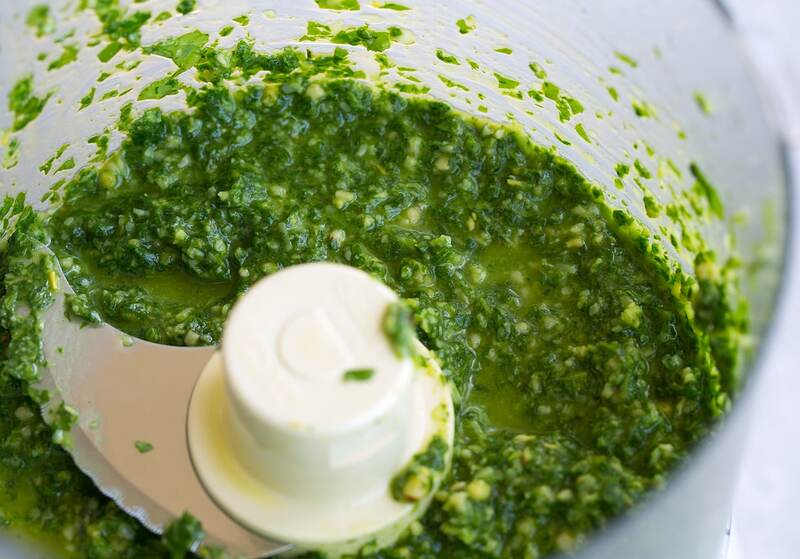 While the chicken is grilling, prep the pesto in a food processor. 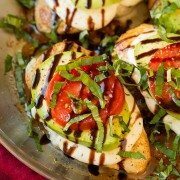 Then add mozzarella to each end and serve the skewers warm with plenty of pesto and balsamic glaze. So much goodness! If you want it even more flavor you can season the chicken as well (I was just trying to cut back on the ingredients list), season with onion powder, garlic powder and Italian seasoning. Use a store-bought pesto if short on time. It’s not as good and the color isn’t as pretty but in a pinch it will work. Already have sirlion steak on hand? I’m sure they’d be good with steak in place of chicken. Make the glaze from scratch if you’re all about homemade. In a small saucepan whisk together 1/2 cup balsamic vinegar and 1 Tbsp honey. Bring to a boil then reduce heat to medium-low. Simmer, stirring frequently, until reduced to about 3 Tbsp, about 10 – 13 minutes. Let cool (it will thicken more as it cools). A perfect summer recipe! 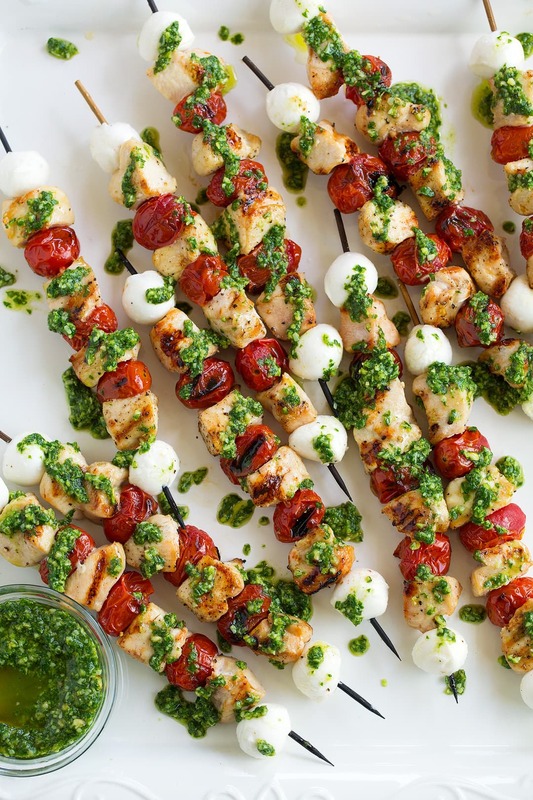 Bite size chicken pieces and cherry tomatoes are threaded onto skewers and cooked on a grill to give them a light fire kissed char, then you finish them off with fresh homemade pesto and a sweet and tangy balsamic glaze. If using wooden skewers soak in water at least 1 hour (I like to soak overnight. I used 11 8-inch skewers). 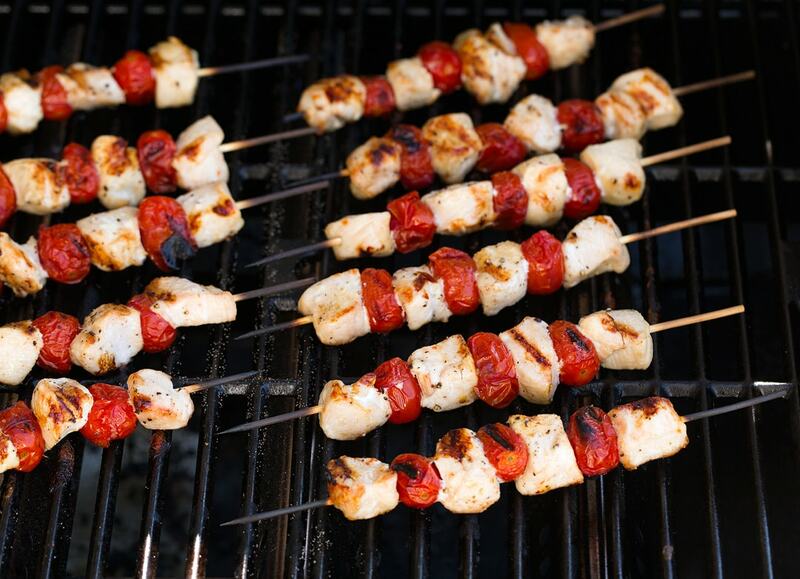 Thread chicken and tomatoes onto skewers (as pictured above, 4 pieces of chicken and 3 tomatoes per skewer). Brush both sides with 1 Tbsp olive oil and season both sides with salt and pepper. Grill chicken kebabs about 4 - 6 minutes per side until chicken registers 165 in center. 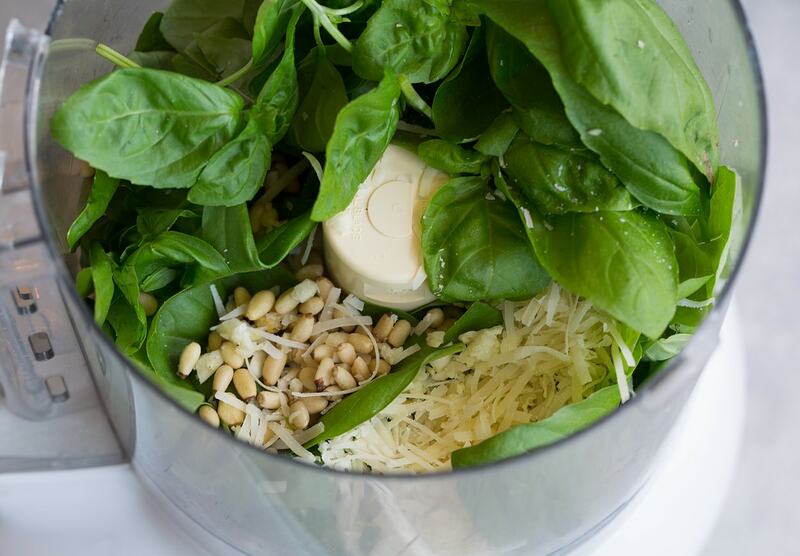 Meanwhile prepare pesto, in a food processor pulse basil, parmesan, pine nuts and garlic several times until minced. Season with salt and pepper to taste and with food processor running slowly pour in olive oil. 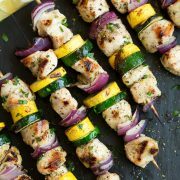 Once kebabs have cooked through remove from grill and thread one mozzarella ball onto each end of the skewer, spoon pesto over kebabs and drizzle with balsamic glaze.